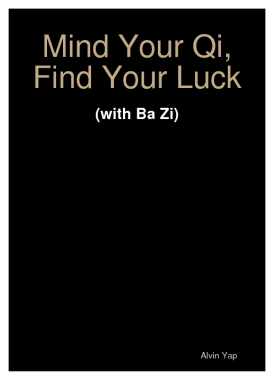 The mind is a powerful place to harness the energy of luck and it is controlled by the forces of Qi. If you know what is in store for you through your birth chart or Ba Zi, your destiny is in your own hand. By knowing what you have, you can leverage the mind to achieve what you want in life. It starts with the understanding of how Qi works through the Four Pillars of Destiny. When you have mastered your mind, you can find your luck to win life’s battles. If there is one book you must buy this year, let this be the one. The secrets and powerful lessons you will learn from this e-book will stay with you for life! This book is also featured on goodreads.com, the world's largest site for readers and book recommendations. Click the button below and make your payment through our affiliate PayPal. Thereafter, please notify us through email at nlphabit@yahoo.com and we will email to you the E-Book in the next hour. But over here, our website holds the right to the publication and we can give you the latest updated edition which is 141 pages.